As 2019 is now upon us, here’s our list of 12 huge prospects who could be ready to make a name for themselves this year. 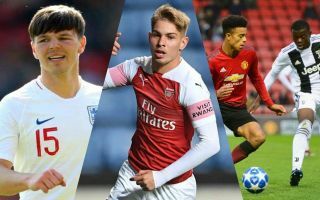 Of course, some of these Arsenal, Manchester United, Liverpool and Chelsea talents will already be fairly familiar to you, but we expect a few of them may take their game to the next level over the course of this calendar year. Still only 18 years old, Emile Smith Rowe has made a real impression in limited appearances with the Arsenal first-team this season. The England Under-19 international is yet to make an appearance in the Premier League with the Gunners, but has three goals in six games coming in the League Cup and Europa League. It surely won’t be long before Smith Rowe starts playing more meaningful matches for Unai Emery’s side. This 17-year-old looks a seriously special talent based on his eye-catching displays at youth level for Manchester United. Mason Greenwood will have plenty of competition ahead of him at Old Trafford, but with Marcus Rashford breaking through at a similar stage of his career a few years ago, Greenwood looks another who we could be seeing a lot more of very soon. Extremely prolific at youth level, Bobby Duncan is one to watch out for at Liverpool as we head into 2019. Again, the quality is high at Anfield and none of Mohamed Salah, Roberto Firmino or Sadio Mane will give up their places up front too easily. Still, whether in an increased role in the Liverpool first-team or perhaps a loan away, Duncan has what it takes to make more of a name for himself this year. Whether his future lies at Chelsea or not remains to be seen, but Callum Hudson-Odoi has shown he can have a big 2019 if everything pans out right for him. Sky Sports have linked the talented attacker with Bayern Munich, with the 18-year-old perhaps set to become the next English talent to make it big abroad. Hudson-Odoi scored his first Chelsea goal in the Europa League earlier this season and fans would love to see more of him, even if the Blues don’t have the best track record in that respect. A player slowly working his way into the Manchester City first-team, Phil Foden is surely going to make a step forward in 2019. The 18-year-old looks a class act on the ball and an intelligent player who would probably get into a number of Premier League sides already. So whether it’s at City or perhaps on loan somewhere else, Foden is definitely another we can expect to see more of this year. Currently tearing it up on loan at Hoffenheim, keep a close eye on Reiss Nelson in 2019 as big things surely lie ahead. The 19-year-old winger’s form in the Bundesliga surely means an Arsenal first-team place awaits for him in the second half of this year. And with Jadon Sancho managing a first England cap after his breakthrough in Germany, perhaps one isn’t too far away for Nelson either.